Cognitive impairment is prevalent among people with substance problems and a factor affecting retention in treatment. Empirical phenomenography was used to systematically explore how people with cognitive impairment viewed a novel residential rehabilitation program – Project RE PIN – designed with cognitive compensatory behaviour change activities and from a strengths-based approach. Twelve participants took part in semi-structured interviews and cross-case analysis identified the overarching theme of change. Key program elements were the safe environment, structured routines, modified psycho-educational material and staff support. Critical changes that participants attributed to the program were in dealing with their own and others’ emotions, experiencing daily life without drugs or alcohol and reframing their self-view. Fear and anxiety about relapse were common and few participants had strategies or support to cope in the future. This study demonstrates that program activities changed participants’ thoughts, feelings and behaviours about themselves and their substance use. The results indicate that RE-PIN’s modified content and processes can benefit people with cognitive impairments in treatment. The study highlights that some treatment users may be vulnerable to resumption of drug use despite gains made during a residential program and their desire to remain substance-free. Drug and alcohol treatment interventions aim to change a regular harmful behaviour. Current approaches to drug and alcohol treatment predominantly use psycho-social methods, usually cognitive behaviour therapy (CBT), as an adjunct to medication within individual and group counselling and residential rehabilitation programs. Relapse after substance treatment is reported to be commonplace, with studies suggesting 94% of people have used at least once 12 months post-treatment  and between 40 and 60% of people returning to substance dependence [2, 3]. Behaviour change theories and relapse prevention models identify environmental triggers such as contact with other drug users and drug availability ; psycho-biological cravings , mood instability  and limited self-efficacy [6, 7] as important factors in high relapse rates. To minimise relapse, high intensity treatment options are recommended for severe and chronic substance dependence where reducing or abstaining from drug use is perceived to be more difficult [8, 9]. Residential rehabilitation is the most established treatment option for people with severe substance problems . Treatment components typically include group and individual therapy, psycho-education, and within 12-Step and therapeutic community models - self-help and mutual aid groups. The most significant factors predicting success (abstinence or reduced drug use) following residential treatment were found to be treatment completion/retention [11, 12]; continuing care post-discharge; employment; and older age . Improved retention is also associated with factors other than client characteristics. These factors include strong client-staff relationships, a supportive and comfortable environment, and a consistent daily routine [14–17]. Completion rates in residential rehabilitation vary widely (i.e. 9–75%), averaging approximately 30% . Clients stay just one third of the time they planned to . An association between substance use and cognitive impairment may partly explain why people with substance problems do not engage with residential treatment or leave early [14, 18]. Prevalence estimates of cognitive impairment among treatment-seeking-substance users vary from 30 to 80% [19, 20]. People with cognitive impairment are also less likely than others to complete treatment . In their prevalence study, Allan et al. (2012) defined cognitive impairment as an umbrella term used to refer to the impacts of long-term drug or alcohol use, acquired or traumatic brain injury, intellectual disability, or Foetal Alcohol Spectrum Disorder (FASD) . While each of these conditions can vary in severity and impact, they have similar broad effects on executive function [18, 22]. Individuals with some form of cognitive impairment will typically experience one or more of the following: impaired ability to plan and make decisions, reduced ability to evaluate consequences, a preference for reward-seeking goals, impulsivity and attentional dysfunction, lack of initiative, memory deficits, impaired self-monitoring and self-regulation, and an inability to benefit from experience [18, 21]. Further, those with some form of cognitive impairment are more likely to experience poor concentration, depression, emotional instability, irritability, impulsive or inappropriate behaviour, reduced ability to problem-solve and inflexible thinking [23, 24]. These factors suggest that people with cognitive impairment are likely to have difficulty engaging with and participating in substance misuse treatment that is predominantly based on cognitive and behavioural change activities. In recognition of these issues and driven by the imperative to improve treatment retention of people with cognitive impairment, a program entitled ‘Project RE PIN’ (Receive, Encode, Process and Integrate drug and alcohol treatment strategies for people with cognitive impairment) [hereafter RE PIN] was developed. 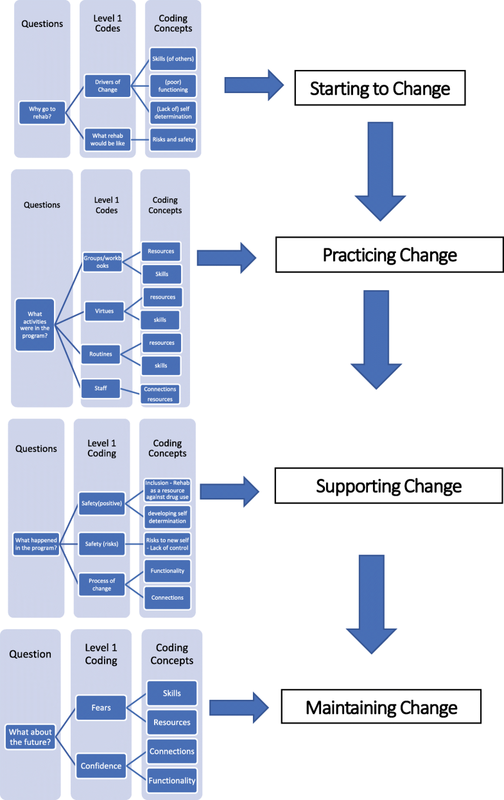 To facilitate this novel approach to practice change, the organisation secured philanthropic funding for a project coordinator to synthesize existing evidence of inclusive program models that were suitable for the rehabilitation context and for an independent evaluation of program development. The RE PIN program aimed to enhance the lives of individuals with cognitive impairment and substance problems, by developing, implementing and evaluating a new type of drug and alcohol rehabilitation that was inclusive of people with cognitive impairment. The program was developed using strengths-based principles and person-centered practice because these approaches had been shown to improve treatment retention in some studies [25, 26]. The program content was devised using universal design principles to ensure suitability for people with cognitive impairment. Universal design endeavours to make environments, resources and education methods accessible for people with CI [27, 28]. Psycho-educational groups, program materials and activities were designed to be easily understood: the provision of information and skills was delivered in ways that met a variety of learning styles; and intentional strategies for people who needed assistance to understand and retain routines, tasks and instructions were used. The psycho-social components focused on practicing skills before introducing concepts, used repetition and role play, and simplified written material to complement verbal instruction. Daily routines were strictly maintained, residents were assisted to use memory aids such as diaries, and staff were trained to understand how cognitive impairment could manifest in behaviour and how to use simple inclusive techniques such as reminders about appointments, tasks or house rules, rather than interpreting forgetfulness as non-compliance. This study aims to understand how a residential substance use rehabilitation program designed to be inclusive of people with cognitive impairment influenced the treatment experience of residents with cognitive impairment. The study was part of a larger project to document the process of developing and implementing RE PIN that sought the perspectives of residents, staff and management. Ethics approval to conduct the research was granted by the UNSW Human Research Ethics Committee in April 2016 (reference number: HC16131). Program materials available from first author on request. Wattlegrove is a 3-month voluntary rehabilitation service for men and women located in regional NSW, Australia. It works with up to 16 people at a time after each resident completes 1–2 weeks of medically supervised withdrawal prior to commencement. A previous study has identified that almost half of Wattlegrove’s residents were likely to have a cognitive impairment and that program completion rates for this group were significantly lower than for residents without a cognitive impairment (10 and 56% respectively) . As a result, in 2016, Wattlegrove was modified to better meet the needs of people with a cognitive impairment while maintaining its ability to treat those without cognitive impairment. A strengths-based approach was used to shape the RE PIN program [25, 26]. Strengths and skills intended to be developed by the program included self-determination, empowerment, choice and control in daily functioning [29–31]. The program ethos was guided by the Virtues Project , a United Nations supported anti-violence program, and modelled by staff to encourage self-reflection, boundary setting and enhanced self-esteem. Empirical phenomenography was used to systematically explore participants’ experiences of the treatment program. Phenomenography is designed to identify the similarities and differences in participants’ descriptions of the same complex social phenomenon . The phenomenon in this study was a residential rehabilitation program in which all residents participated in the same routines and activities including psycho-educational and therapeutic groups. The theoretical basis and delivery modalities of the program were not explicitly explained to participants, so their perspectives were constituted by their own understanding of the phenomenon . Sixty-seven people took part in the rehabilitation program during the 12-month study period of which 33 were assessed as having a cognitive impairment. Prior to their admission, all residents completed a 7–14-day withdrawal program and were assessed by a medical practitioner as having completed withdrawal. A member of the research team (Author: AM) administered a cognitive screening tool, Addenbrooke’s Cognitive Examination Revised (ACE-R) to all residents during their first week in the program to determine eligibility to participate in the evaluation. The ACE-R is a brief cognitive screening tool that has been used to detect cognitive decline and monitoring cognitive function . Although the ACE-R was designed for the dementia field, it, like the Montreal Cognitive Assessment (MOCA), has been used in many other populations and has an Australian version [36, 37]. All eligible residents consented to participate in the study and were invited to an interview to occur eight to ten weeks later, to allow enough time for them to reflect on their experience of the program. Eighteen people agreed to an interview but six had left the program by the interview stage and could not be contacted. A total of 12 residents took part in an interview conducted by a member of the research team (Author: SC). Semi-structured, open-ended interviews took place via computer video link between July 2016–January 2017. Participants were asked to reconfirm consent prior to their interview and consent to record the interview was also provided. Interview topics included: how the person came to be in the program; how well it met their expectations; positive/less positive aspects; how helpful it had been; plans/concerns for the future. The interview transcripts were deductively coded (Author: JA) using the interview schedule to sort the transcripts into initial codes based on the answers to the interview questions (Fig. 1). NVivo software (QSR International Pty Ltd) was used for data management. Systematic text condensation (STC) was used to organise and code the interview data into concepts by comparing the content and meaning of responses [38, 39]. STC is an appropriate method for a small sample describing the same thing . Initial codes were reviewed and participant responses sorted into descriptions of their experiences for each question and the text was read line by line to identify elements of the coding concepts listed in Fig. 1. The concepts of interest were determined by the strengths-based philosophy of the rehabilitation program as being personal change in perceived substance use and how this change was related to the program elements of resources, connections, skills, empowerment and functionality in daily living [30, 40]. Additional concepts of risk and safety were identified during the coding process and incorporated into the analysis. Co-authors (SC, AM) reviewed the codes and concepts to confirm validity during the analysis process. Once coded, the re-organised pieces of text were read and analysed according to the key phenomenographic concept of interest: the influence of the inclusive rehabilitation program on participants’ experience of treatment. The final cross-case analysis identified the overarching theme of change as the coherent concept grounded in the participants’ accounts of the residential rehabilitation experience . Findings are organized by starting to change, practicing change, supporting change, and how change may or may not be maintained in the future. There were similarities and differences between residents with cognitive impairment (n = 33) and those without (n = 34). Both groups were similar in terms of age, gender and Indigenous status; however, they differed in the main drug of concern. Amphetamine was the main drug of concern for residents with cognitive impairment (50% compared to alcohol 28%) whereas alcohol was the main drug of concern for residents without cognitive impairment (47% compared to amphetamine 35%). Residents with cognitive impairment were more likely to be younger and to have left school by or before 16 years compared to residents without cognitive impairment. Retention rates were similar across both groups. Residents with cognitive impairment were more likely to complete the program than those without (49 to 41%). However, this was not statistically significant. Almost half of all residents did not complete the program and there was no difference for those with cognitive impairment (47%) and those without (48%). Characteristics of study participants (n = 12). Study participants were, on average, 34.5 years and had an ACE-R score of 77.5 (range = 63–851). All participants relied on government payments for income. Alcohol was identified as the primary drug of concern by five participants (42%), three identified cannabis (25%), three identified amphetamines (25%) and one person identified opioids as their principal drug of concern (Table 1). Four program elements were described by all the participants as assisting them to develop skills, resources and connections. The four elements were group-based and included use of workbooks, daily virtues, routines, and staff. Only one participant reported not wanting to participate in the virtues group and perceived no benefit from the activity; “So, I don’t think virtues really work.” [Participant 6]. Most participants described significance of the changes achieved with one person summing it up as, “As a matter of fact, it’s given me a second life.” [Participant 2]. However, they lacked a sense of agency, control or confidence in being able to maintain the changes. Participant 3 explained there was just hope it would “stick” in spite of the risks, triggers and fears about returning to regular drug use. This study explored how people with cognitive impairments experienced a novel residential rehabilitation program purposely designed to offer a strengths-based and cognitively compensatory methods for behaviour change. Twelve residents screened as having cognitive impairment took part in semi-structured interviews. Thematic analysis discerned change as the overarching concept that organised their experience of rehabilitation. Overall, the program met the participants’ needs for learning about and practicing behaviour change. The program was well received, relevant and liked by the study participants. This is a significant achievement when most of the participants did not voluntarily choose to enter residential rehabilitation but felt coerced or obliged to do so. The environment was generally viewed as positive and supportive and the program content was accessible to people with cognitive deficits. People with cognitive impairment completed treatment at the same rate as others in the program (49%), suggesting the RE PIN program met their needs equally well. This is a substantial improvement on the retention rate prior to the program introduction, where only 10% of residents with cognitive impairment completed treatment . However, strategies for maintaining change in the future and a lack of ongoing support were a source of fear and anxiety for the participants, suggesting a high risk of relapse. Participants were clear about the environmental and personal triggers that posed a risk of ongoing drug and alcohol use. However, there was less clarity about how treatment could help upon entry to the program. Participants had implicit trust that the treatment program would help reduce their problematic substance use and program philosophy, strategies and techniques were not questioned. This degree of trust puts a significant responsibility on treatment providers to deliver something that works to meet people’s diverse needs and circumstances. Being in a secure rehabilitation environment was perceived as a key safety factor and when that setting was breached by other residents’ drug use or by external factors such as outings, participants described a sense of vulnerability to resumption of drug use. Many expressed fear and anxiety about relapse and concerns about their ability to resist cravings. Drug availability combined with limited self-efficacy are critical factors in relapse and challenges for all those leaving a residential setting [4, 6, 7]. However, this group of residents were likely to be facing these challenges without identifiable sources of support, leaving them to rely on personal willpower to avoid or resist drug use. Aftercare has been identified as an important treatment component that assists in preventing relapse  and this did not appear to be available to participants in this study, or they were unaware of these options. Going on ‘prac’ was a test of self-efficacy but participants were aware that triggers and cravings for drug and alcohol use would persist for an extended period, perhaps indefinitely. The program achieved its aim to deliver a strengths-based approach. Program content and materials were relevant, accessible and applicable to the rehabilitation needs of residents with cognitive impairment. This study confirms earlier research about the benefits of developing skills in communication, reflection, and self-awareness of the impact of moods on triggers to drug use . There were multiple examples of plans to apply program learnings in the future and the daily virtues program was frequently cited as a practical way to build self-esteem and confirm personal values. Staff are established as being a vital component of successful treatment programs and provide support, security and stability for the group . However, there continues to be a need for individualised attention within the group program to overcome shame or embarrassment about disability and ensure that the learning material is accessible for everyone. More individual planning could facilitate greater development and application of behaviour change strategies as well as post-treatment community reintegration in a safer fashion. The results of this descriptive study are specific to the program and participants and therefore cannot be generalized to all residential drug and alcohol treatment. However, the experiences of these participants highlight the changes people experience in a residential program, how they perceive the program content and ways it can be applied. Further research on program outcomes through the administration of standardised instruments at commencement, completion, and 3 months post-treatment would further demonstrate the impact of the program on participants including those without cognitive impairments. Comparing the experiences of people with and without cognitive impairments could clarify which program components have the most impact. More research to establish an evidence-base for best practice in drug and alcohol treatment by comparing resident outcomes attained in this program to those found in conventional residential drug and alcohol treatment programs would be useful for the treatment sector. This study has explored the experiences of people with cognitive impairment in a novel residential substance treatment program. It has demonstrated ways that strengths-based program activities impacted on participants’ self-view and their substance use behaviours. The results describe the way people with cognitive impairment make use of treatment activities and derive benefit from treatment. However, further research is needed to understand how these benefits occur and how they can be maintained. The study also highlighted a vulnerability to relapse post-treatment despite clear intention to remain substance-free and the need for aftercare, particularly for those who lack social support. The Authors acknowledge and thank the residents and staff of Wattlegrove for their time and contributions to this study. The work was supported by a grant from The Ian Potter Foundation. All authors participated in the study design. AM and SC conducted the data collection. JA carried out the initial analysis. SC and AM checked the initial analysis and all contributed to the final analysis. JA drafted the manuscript. All authors contributed to revisions. All authors read and approved the final manuscript. Kelly JF, Abry AW, Milligan CM, Bergman BG, Hoeppner BB. On being "in recovery": a national study of prevalence and correlates of adopting or not adopting a recovery identity among individuals resolving drug and alcohol problems. Psychol Addict Behav. 2018 Aug 2. https://doi.org/10.1037/adb0000386 [Epub ahead of print]. Australian Institute of Health and Welfare [AIHW]. Disability in Australia: acquired brain injury. Bulletin 55. Canberra: Published 2007. https://www.aihw.gov.au/getmedia/1f719b27-6b93-434a-b0e6-997b4ead061a/bulletin55.pdf.aspx?inline=true. Accessed 21 Mar 2019. Rapp C, Saleebey D, Sullivan PW. The future of strengths-based social work practice. Adv Soc Work 2005, 6 (1): 79–90. http://journals.iupui.edu/index.php/advancesinsocialwork/article/view/81. Accessed 1 Sept 2018.